A lot of people have been asking me why I went on strike. I have a simple answer: Because I'm not a teen anymore. I work at McDonald's, and I hear a lot of people talk about how fast-food jobs are for teenagers. Well, I'm not a teenager. I'm 33 years old. And I work with a lot of people in their 30s, 40s and 50s who are working to pay their rent and put food on the table. I worked fast-food as a teen to make a few extra bucks for clothes and a cellphone. My job didn't pay me enough to support myself, but I didn't need to support myself. I thought I'd go on to get a "grown-up" job, one that would pay all my bills and not have to choose between food and keeping the lights on. I did get that "grown-up" job, selling skin products at a brand-name skin-care store. I got to use my people skills -- working with customers to figure out which products were best for their skin. The more I listened to and connected with customers, the more I sold. I was good at my job. I ended up being a top salesperson. I made $16.50 an hour plus some commission. I felt good knowing that I was helping the company be profitable and helping myself. I made enough in base salary to be able to afford a roof over my head, food on the table and decent clothes. And if I worked really hard and made a lot of sales, I got more money, too. I had that job for 6½ years. Then the economy crashed, and people didn't have money to spend on face lotions anymore. At first, I thought I'd get another decent-paying job in a month or two. I had good sales experience and great references. I couldn't find another decent sales job, no matter how hard I tried. So I finally did something I never thought I'd do. I got another fast-food job. I make $7.25 an hour, less than half of what I made in my last job. That's OK if you're 16 and you want to buy a phone or sneakers, but it's not OK if you're supporting yourself. Even though I serve food at my job, I can't afford to buy enough food. I have to rely on food stamps. I'd go hungry without them. When I went on strike last week, I was in a crowd of other workers who are struggling just like me. Most of us are older and have rent and bills to pay. Some of us have kids. All of us have to make hard choices between food and medicine, lights and rent. We all worry about going hungry or ending up homeless. We don't make enough money to take care of ourselves or to help our neighborhoods. If we had a few extra dollars in our pockets, we'd spend it and help create jobs and help get the economy going again. It gets to me. I was a pretty happy person when I worked at the skin care store, but now I have panic attacks. I went on strike last week because I can't stand the stress of trying to live on minimum wage. Worrying about the future is the hardest part, because at $7.25, I don't have a future. 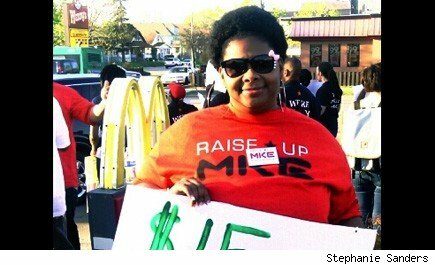 Stephanie Sanders is a McDonald's worker and a member of the Milwaukee Workers Organizing Committee, fast-food workers who have joined together to seek fair pay and the right to form a union. Her story was originally published in Milwaukee Journal Sentinel.